In American football and Canadian football, a lateral pass or lateral (officially backward pass in American football and onside pass in Canadian football) occurs when the ball carrier throws the football to a teammate in a direction parallel to or away from the opponents' goal line. A lateral pass is distinguished from a forward pass, in which the ball is thrown forward, towards the opposition's end zone. In a lateral pass the ball is not advanced, but unlike a forward pass a lateral may be attempted from anywhere on the field by any player to any player at any time. While the forward pass is an invention of the North American games, the lateral and backward pass is also a part of rugby union and rugby league, where such passes are the norm. Compared to its use in rugby, laterals and backward passes are less common in North American football, due to a much greater focus on ball control in American football strategy; they are most commonly used by the quarterback, after taking the snap, to quickly transfer ("pitch") the ball a short distance to a nearby running back (or, rarely, wide receiver) on a rushing play. Laterals are also often seen as part of a last-minute desperation strategy or as part of a trick play. Examples of plays utilizing the lateral pass are the toss, flea flicker, hook and lateral, and buck-lateral. While a forward pass may only be thrown once per down by the team on offense from within or behind the neutral zone, there are no restrictions on the use of lateral passes; any player legally carrying the ball may throw a lateral pass from any position on the field at any time, any player may receive such a pass, and any number of lateral passes may be thrown on a single play. Additionally, a player receiving a lateral pass may throw a forward pass if he is still behind the neutral zone, subject to the forward pass rules. Unlike a forward pass, if a backward pass hits the ground or an official, play continues and, as with a fumble, a backward pass that has hit the ground may be recovered and advanced by either team. Backward passes can also be intercepted. A lateral may be underhand or overhand as long as the ball is not advanced in the pass. A ball that is passed exactly sideways is considered a backwards pass. 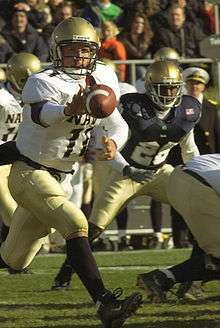 If it hits the ground, the person throwing or "pitching" the lateral pass will be subjected to the fumble designation in the statistics in the NFL, even if the ball is dropped or muffed by a teammate, although in college football this can be credited to whichever player the statistician feels is most responsible. If the ball hits the ground after travelling even slightly forward, however, it is then incomplete instead of a fumble. The oxymoron "forward lateral" is used to describe an attempted "lateral" (backward pass) that actually goes forward. In most cases, it is illegal. A variant, the hook and lateral, where a forward pass is immediately passed backward to a second receiver to fool the defense, is used on occasion. The lateral pass rule, or rather the lack of restrictions contained therein, has given rise to some of the most memorable and incredible plays in football history. Both collegiate and NFL football have certain examples of football lore which involve laterals. One famous college play involving the backward passes is simply known as The Play. In the 1982 Big Game between Stanford and California, with four seconds left and trailing by one point, Cal ran the ball back on a kickoff all the way for the game-winning touchdown using five backward passes, eventually running through the Stanford Band, who had already taken the field (believing the game was over after Stanford players appeared to have tackled a Cal ball-carrier). The game remains controversial because of Stanford's contention that the Cal player's knee was down before he passed the ball during the third lateral and that the fifth lateral was an illegal forward pass. A well-known and controversial NFL lateral pass occurred during the Music City Miracle play at the end of the 2000 playoff game between the Tennessee Titans and the Buffalo Bills. The play was a true lateral (the ball did not move forward or backward in the pass), but the receiver was a step ahead of the passer and reached back to catch the ball, so it gave the appearance of an illegal forward pass. Another well known backward pass in the NFL was the River City Relay in a game between the New Orleans Saints and the Jacksonville Jaguars on December 21, 2003. With time running out, the Saints threw backward passes and brought the ball down the length of the field for a touchdown. However, kicker John Carney missed the extra point, which would have tied the game, so the Saints lost by one point, 20–19. Another well known play was executed in a college football game by Presbyterian against Wake Forest in 2010. In this trick play, three lateral pass rules were used in combination. First the quarterback passed the ball sideways while intentionally bouncing the ball on the ground (a so-called "fake fumble pass"). The pass-receiver faked the end of the play, suggesting that it was an incomplete pass, but then passed the ball forward to a wide-receiver, who successfully ran for a touchdown. Wake Forest coach Jim Grobe described the play "as well executed as anything I’ve ever seen". In a Division III college football game on October 27, 2007, Trinity University was trailing by two points with two seconds left in a game against conference rival Millsaps College. Starting from their own 39-yard line, Trinity called a play for a short pass across the middle. The receiver pitched the ball backward, with a sequence of additional backward passes as players were in danger of being tackled. The "Mississippi Miracle" ultimately included 15 backward passes as it covered 61 yards for the winning touchdown. On October 31, 2015, the Miami Hurricanes threw eight lateral passes over the course of 45 seconds to score a touchdown and upset the 22nd-ranked Duke Blue Devils 30-27. The play stirred controversy amid a number of missed calls by the Atlantic Coast Conference officiating crew. 1 2 NFL Rules Digest: Backward Pass, NFL.com. ↑ NFL Rules Digest: Forward Pass, NFL.com. ↑ Briggs, Jerry (October 27, 2007). "Football: Trinity wins on miracle play". San Antonio Express News. Retrieved 2007-10-28.